Tampa, Fla.- Have you ever lived with constant fear of not knowing where you were going to sleep at night, or where your next meal was going to come from? This fear is a reality for thousands of children within the Tampa Bay area every day. Metropolitan Ministries, along with the Tampa Yankees, and Saks Fifth Avenue not only put a smile on 35 children's faces today, but gave them all back to school makeovers with a day at the Saks Salon and Spa. The makeovers included haircuts for every child, along with manicures for all the girls. What a treat!
" This is a great experience for the kids to come out and get pampered for the day. They get to feel like a regular kid, prepping, and getting ready to go back to school." States AnaMaria Mendez Community Relations Coordinator of Metropolitan Ministries. Saks has hosted this event for the past 13 years. This is the third year that they have actually brought the children into the store instead of doing the event onsite at Metropolitan Ministries. This event put off the reality they are living with for a few hours so they can have a great time just being a kid! 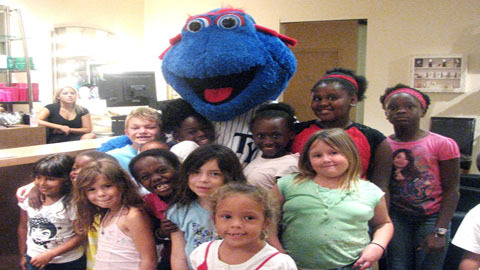 The Tampa Yankees mascot, "Blue", made an appearance for the big day, and passed out backpacks filled with TY hats, folders, and kidz packs. The kids absolutely loved all of their goodies, and the thrill of taking pictures with "Blue." Metropolitan Ministries has been serving the Tampa Bay community for 38 years. There are over 20,000 homeless in the area, many of them being children. Metropolitan Ministries is helping as many as 150 families a day, providing them opportunities to get back on their feet. Last year there were over 200 children that resided with their families at Metropolitan Ministries. Metropolitan Ministries truly are making a difference within our community and changing many children's lives one day at a time.